About a week or so ago, Crusaders Jenn, Elisa, and I decided to get together for a rare mid-week lunch. Even though Elisa and I work relatively close to each other, for some reason we never seem to meet up for lunch. After some discussion on where to meet, we decided that we would go to Roland Park Bakery and Deli, which recently relocated to Chestnut Avenue in Hampden. They have been in business for almost 30 years and are well known for their delicious sandwiches and baked goods. Cupcakes aren’t their main focus, but on a previous trip there I noticed that there was a small selection so we thought this would be the perfect lunch spot for us. After each of us ordered our sandwiches (we all chose the daily special which was sliced turkey breast on freshly baked bread with cranberry sauce – SO GOOD! ), we decided to share two cupcakes. There aren’t any labels for the cupcakes and instead of asking for the flavors, we pointed to two which looked like a classic vanilla and a slightly more fancy one that looked like a S’mores cupcake. What we first thought was Vanilla/Vanilla with a colored frosting, ended up actually having a hint of lemon flavoring. Even if this cupcake doesn’t look like something special, it was actually really good. The frosting was sweet, but since there was just a smear of it on top, it didn’t overpower the cupcake. The cake was moist and actually had a bit of a crunch around the edges which we all enjoyed. Unfortunately the second cupcake didn’t go over as well. 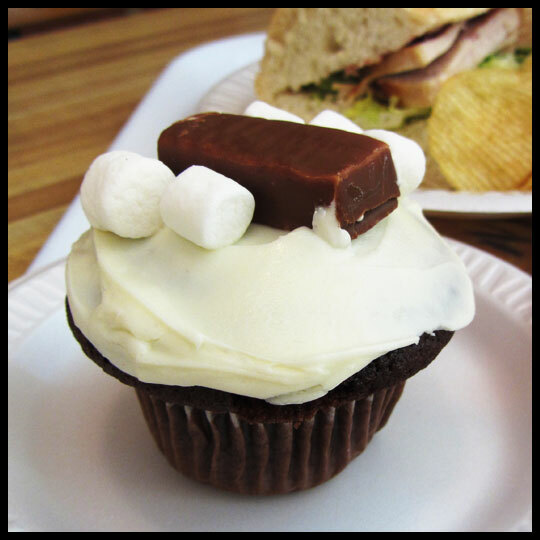 As I mentioned above, at first glance we thought this was a S’mores cupcake, but after further examination we realized it was more of a chocolate marshmallow cupcake topped with a Charleston Chew. While the Lemon Vanilla cupcake was right on target, this one was a miss for us. The marshmallows on top were stale and chewy, the chocolate cake was dry, and the frosting was way too sweet. Elisa didn’t seem to mind the cake too much though and she thought that the combination of the sweet frosting with the mild chocolate cake balanced out well flavor wise. My thoughts? Not so much. After one bite, I decided I was done. Even though one cupcake was a win and the other wasn’t, their cupcake prices are really good, their sandwiches are amazing, and their cookie selection is extensive. It’s no surprise why they have maintained a well loved business for over 25 years. 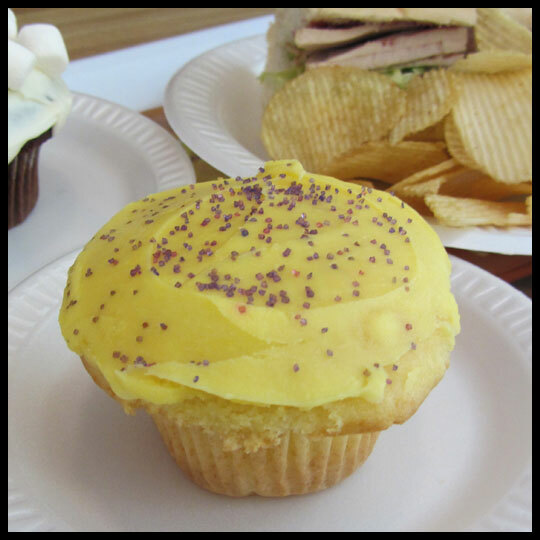 This entry was posted in Baltimore, Cupcakes and tagged baltimore, Charleston Chew, Chocolate, Hampden, lemon, marshmallow, Roland Park Bakery and Deli, vanilla by Stacy. Bookmark the permalink. Hi Sabrina, thank you for visiting our blog. As I’ve told 3 other people who have all recommended Ady Cakes (within a months time, you are actually the 2nd today and both appear to do work for Ady Cakes), we really hope to one day visit, but unfortunately Reading is a bit of a hike for us and not along the way to too many places I visit. If Ady Cakes really wants us to try their cupcakes and is willing to ship them, we would be more than happy to do a review. Thanks again!